Ananas comosus (also known as the Ivory Pineapple and Variegated Pineapple) is grown for its long green leaves vertically striped with ivory along the leaf margins studded with sharp (sometime pink tinted) spines. When planted in the ground, the ivory pineapple plant can grow up to 36 in/90cm tall and 6 ft/1.8 m across. Size can be contained by planting them in 8 in/20 cm pots. Pineapple plants that are 5 – 6 years old produce a pink fruiting spike that grows into a small brown pineapple over a period of 3 months. The fruit does not have the sweet flavor of cultivated pineapples. 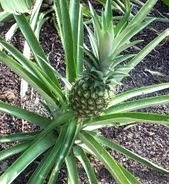 In the summer, move pineapple plants outdoors to a location that receives partial sun. From fall through early spring make sure these bromeliads are in a location that receives a half day of direct light. In the summer, temperature should be at least 85° F / 29° C. During winter ideal temperature is above 65° F / 18° C.
From late spring through the summer, feed plant every two weeks with liquid plant food diluted to ½ the normal strength. Feed monthly in the winter season. In the summer, spray the leaves with water twice weekly to provide moisture. Also, water the roots when the top half of the soil becomes dry. In the winter, plants displayed indoors will need less water due to less sun exposure and lower temperatures. Reduce watering to approximately once a week. Use an orchid potting mix or an African Violet soil. This bromeliad plant requires a heavier potting soil than other species. When the plant produces a fruit, cut off the top (the rosette leaves need to be 4 in / 10 cm long). Allow it to dry for twenty-four hours. Rosette should be planted a dampened mixture of peat moss and sand, and covered with a plastic bag until rooted. It can then be planted in a larger pot. Offsets that appear after the parent plant begins to die can be propagated as well. Repot this plant every two years in the spring. When repotting, do not pack the soil down. Ananas comosus likes are to circulate around its roots. It is a good idea to wear gloves and long sleeves for protection when handling this spiny plant. Individual plants can live five to six years. Although you can grow a pineapple by cutting of the top and rooting it, this bromeliad makes a very attractive houseplant. These plants need lots of room and plenty of sun. An ideal location is on the floor of a large room with lots of windows.